I would recommend this to anyone who asks! These are really sturdy and would be good for any type of footing of a bed. I am sure they will last forever. My husband has problems with his knees and the risers give the couch more height, which help with getting up and down. It also helps with cleaning underneath the couch. I never purchaed other risers before because they were all plastic. When the bed skirt rises now because of the additional height, you see real wood which matches my floor. I live in a very small apartment with little storage space. 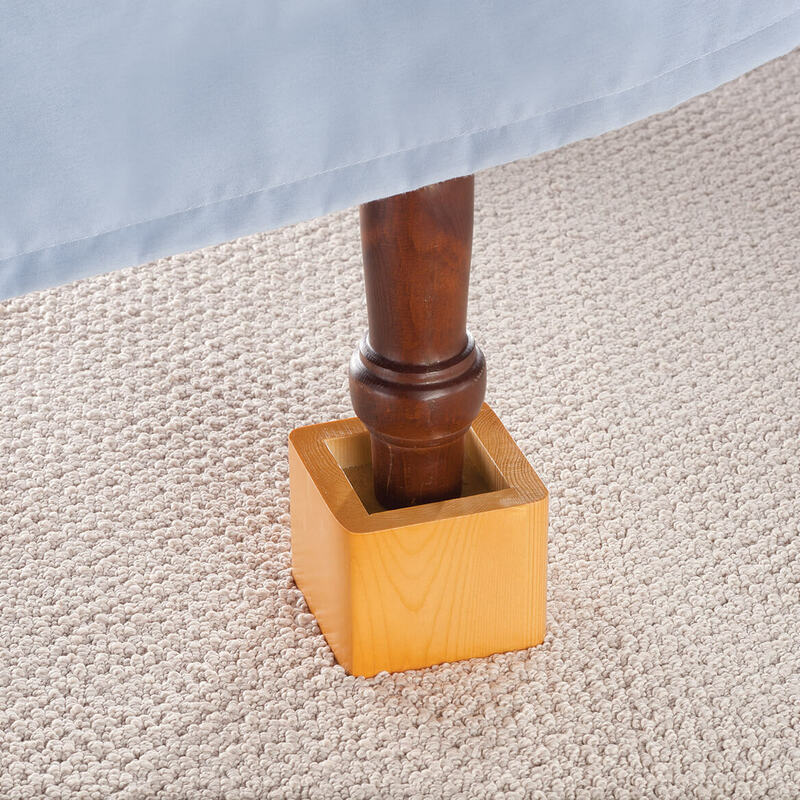 That's why these bed risers are great: I can store a lot of stuff under the bed and keep the clutter down to a minimum. Try it you might like it! As I was trying to say before, I am using to raise scrapbooking table to ease strain on back. Occasionally need to stand and bending over low table ... ouch! Also cannot sit for long periods of time bent over table ... this solved my problem. To work at kitchen counters was not a solution. Try it ... works great ... and very portable ... and versitle! I use this product under the king bed and the queen bed. It gives me unlimited storage for seasonal things as well as making everything easy to get to. Much better than plastic ones. Raised the bed very well, looks very attractive. 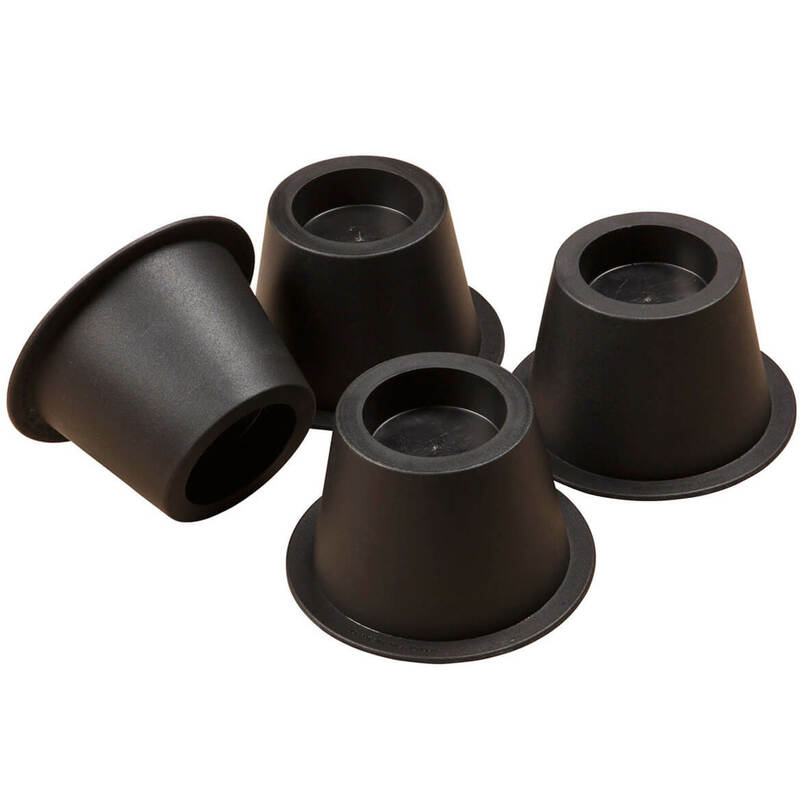 Used them to replace the plastic, black bed risers, looks so much better, like bed legs rather than plastic cups and simple roller legs. I use it so my work table is higher and so my file drawers fit under it. Great for my hobbies. 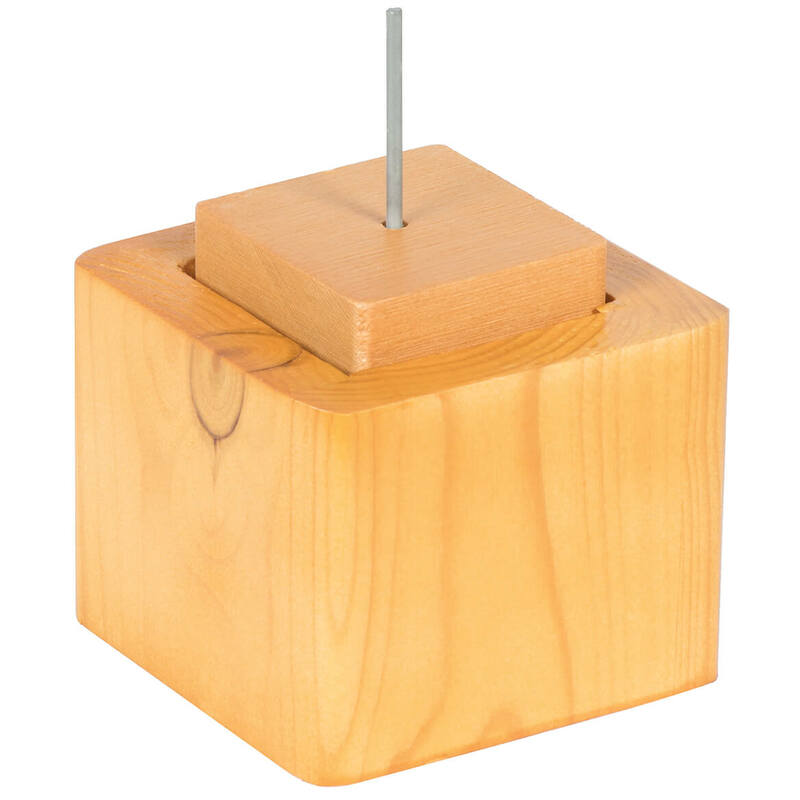 Wish the blocks came a little smaller and half the size but works ok.
We used this item for raising a cedar chest with a 2" clearance up far enough that the heat from the wall vent would not scorch the underside of the chest. We re-directed the air flow with the vent extender unit to put the warm air out in the middle of the floor instead of under the chest by the wall under the window. The ears on the corners of the blocks did not allow proper positioning of the legs of the chest. Knocking the corner ears off was reasonably easy after I learned how the were put on. I used mounting tape to keep the chest from sliding off of the blocks. got a new bed and it was to low it was hard to get up but with the risers I don't have a problem anymore. We using the risers under the legs of the living room suit to help my mother to get up and down better. It one the best things we have order in a long time. I am using these to raise a shelf unit higher. They are sturdy, well made and look very nice. I know they will probably last forever. I am disappointed overall. Tried to stack and had bed fall off of all blocks bending one of the rods! Bought for a chaise lounge and they split in 2 places after 3 months!! I moved into a very tiny apartment and have very little storage area. I am hoping that these Bed Risers will raise my bed enough to put some tubs and boxes underneath my bed! Can't wait to get them! Have looked at other bed risers and these look to be the best quality. I need to raise the bedframe to prevent the bedskirt from sagging. These risers should be just what I'm looking for. guest room bed frame sits crooked (headboard too low compared to feet..) trying to make level. been using large tuna cans, working ok but not very eye appealing. Unable to find any in our area and the reviews are good. I needed to raise the height of my sewing machine. I like my chairs to be higher. I have some of the round plastic ones which are great but thought I would like these for some of my chairs. The bed in the spare room is pretty low. I want to raise it. But wanted these solid wood raisers instead of the plastic type to hold up under more weight. It looked like a good quality of wood. matched my bed post. Not emough room with matress for lower trundle bed. Worked great! It is exactly what I needed to raise our living room furniture to a more comfortable height. A well made product! Can these be used on sofas. How safe r they stacked? 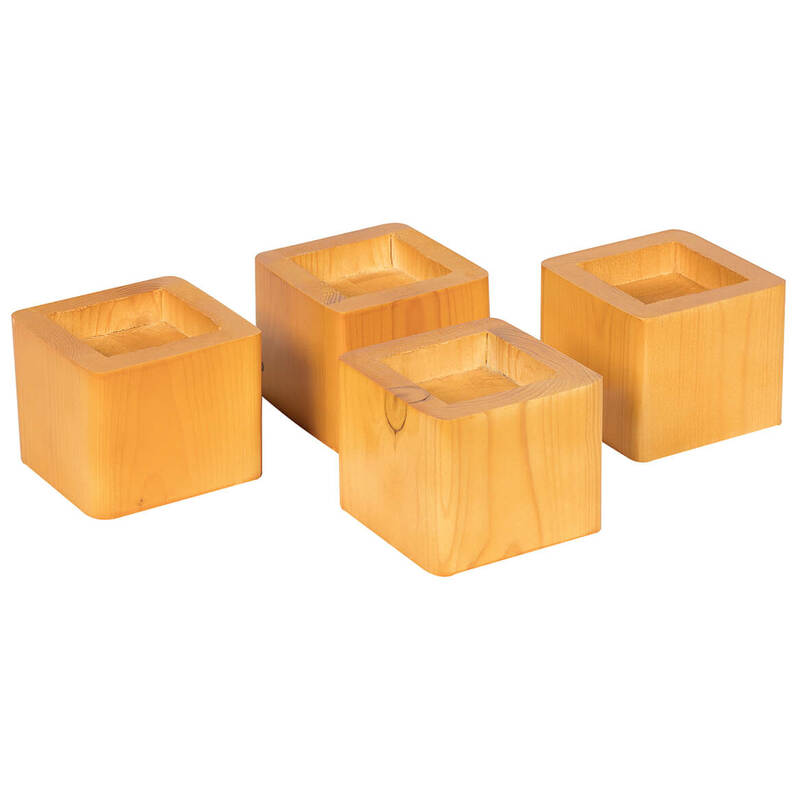 BEST ANSWER: There is a metal piece that connects these wood bed risers. If you want to doubl up with them you will need to purchase another set. Yes, I am sure that they will work on sofa safely. Love them under my bed! Thank you for your question. These can be used on a sofa but we would not recommend stacking them. We hope this information will be of help to you. my sofa legs are 3" X 4" will they fit in the recessed area? BEST ANSWER: Thank you for your question. No, your sofa legs will not fit. We hope this information will be of help to you. 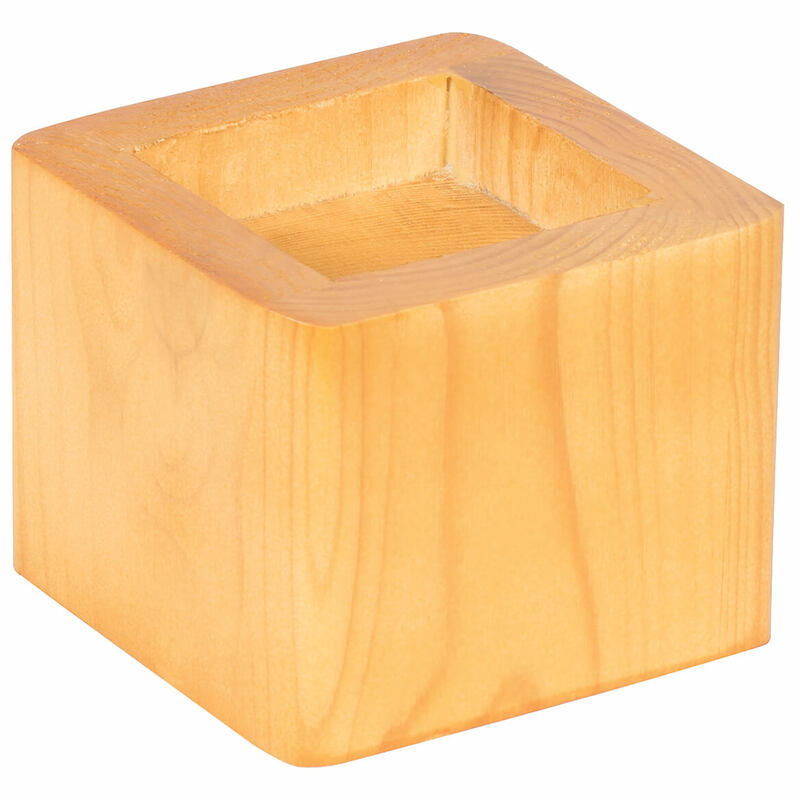 Will a 3 x 3 square bed leg fit into the hole? BEST ANSWER: Thank you for your question. Yes it will. We hope this information will be of help to you.